KODAK, TN – “Get on the Trail with Friends & Missy” is kicking off its 21st year as a guided hiking series to raise funds to support Great Smoky Mountains National Park. 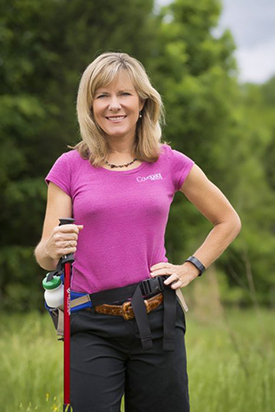 The series features day hikes in the Smokies led by U.S. Olympian and personal fitness guru, Missy Kane, each Wednesday in April. "It's hard to believe we are starting our 21st year of Get on the Trail with Friends & Missy,” said Missy Kane. “I especially love the spring series as the Smokies should be putting on a great wildflower show." Get on the Trail with Friends & Missy is presented by Humana and Knoxville News Sentinel, and sponsored by Home Federal Bank, Cabins of the Smoky Mountains, East Tennessee PBS, Farm Bureau Insurance, and LeConte Medical Center, with special thanks to Rocky Top Tours for logistical support. Friends of the Smokies is an official nonprofit partner of Great Smoky Mountains National Park and has raised $65 million to support critical park programs in North Carolina and Tennessee. Discover and donate at FriendsOfTheSmokies.org.